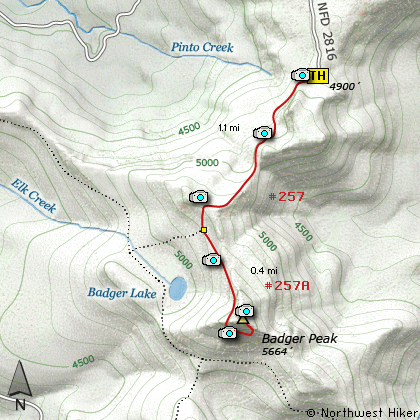 There are couple of ways to climb Badger Peak. For this narrative I drove to the end of Forest Road #2816. The trail immediately descends a couple hundred feet in elevation before it climbs steeply to the first ridge. In season the wildflowers are abundant and make this a delightful little hike. When you reach the crest of Badger Ridge there are great vistas especially if you walk just a bit off trail to the west where there is a rocky outcropping. The trail now descends again a couple hundred feet in elevation. At that point it meets Trail #257A which takes you to the top of Badger Peak. The trail is steep but well maintained. Watch for snow as late as mid-July. The trail curves around the southwest face of the peak and approaches from the southeast side of the mountain. There used to be a fire lookout on top and some of it is still there. 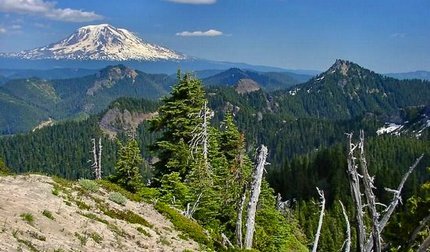 The reason for taking this hike becomes very clear as you gaze at all the surrounding peaks; Mt Rainier to the north, Mt Adams to the east, Mt Hood to the south, and of course Mt St Helens to the southwest. If you are coming from the north via Randle, Washington, you will want to head south out of town on State Route 131. Continue south on this road, which will become Forest Road 25 for the remainder of the journey. In just short of 20 miles you will come to the junction of Forest Road 99, which leads to hikes along Windy Ridge and the east side of Spirit Lake. But for this hike, just continue south on FR25 for about 2 more miles and turn left, or east, onto Forest Road 28. Follow FR28 for about 2.7 miles and then bear right onto Forest Road 2816. You will then follow FR2816 another 4.4 miles to the trailhead for this hike. Follow FR25 north then for about 23 miles, and you will then come to Forest Road 28 on your right. Follow FR28 for about 2.7 miles and then bear right onto Forest Road 2816. You will then follow FR2816 another 4.4 miles to the trailhead for this hike.